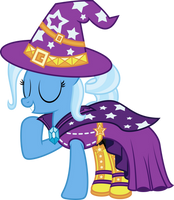 Well my first vector of THE GREATE AND POWERFULL TRIXIE!!!! This is a body fullbosy vector... on the show there is no full body of this image so yea I made the rest of the body... so more points for me!! !